I was trying to write this blog post for quite a long time, and it become so, so big that I’ll have to split it in three posts, It is like a ‘people of kde’ but different, the focus is not to show someone that works for KDE, but someone that tried to use KDE to work – being it a non-tech person. Since I spend most of my days helping people that is struggling with Free Software to pass the hate feeling, I feel that I have lots of things to say being that I’m activelly maintaining over 5 laptops from different friends that lives on different states. I also like to study humans, this very strange animal that has so many different ways of expressing himself that it’s so, so hard to get it right. Cléo Martins, Professional Chef, Vegan and “Wanted to try linux because she liked the concept”, That’s a bold move. Cléo is a Chef, and as such she knows how to cook and it’s not a technological person at all. 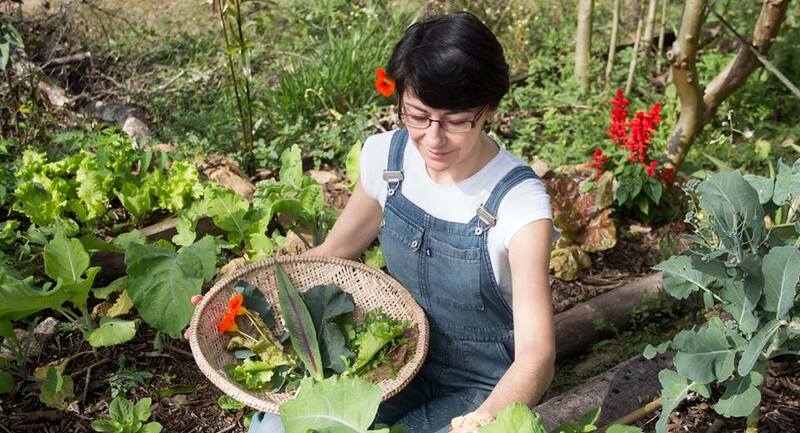 She prefer being in the wild and plant her own organic food, cook, taste and be awesome. She’s also presenting a online course on vegan food. All of a sudden she removed windows from all computers from her school and switched to Ubuntu because someone over the internet told her that it was the best linux that there where and it will ever be, than this person vanished – A lovely thing to do if you need somebody to hold hands for a bit while you understand the system that you are using. Cléo had a *huge* amount of problems on her linux install, tried a few people over the internet, some came to help, some send her a few snippets of code to paste on the terminal and that was making her insanely crazy. “Everyone tells me to do something differently” she cried. The correct locale was not being set on the system /etc/locale , but it was being set on gnome-settings. Printer was printing black and white when she wanted colored output. The dude that installed Ubuntu for her used a 6gbs partition for root and it was full, impossible to update without learning about the unix file systems and creating a link in /var/cache/apt to the other, big partition. So finally she reached me, I’v went to her house and tried to fix all problems that I could, some I couldn’t because of lack of knowledge on Unity / Ubuntu, I’v asked her if she was willing to try another thing, installed and configured KDE correctly, removed the Unity and Gnome stuff that was there and she was much happier, but still hating Linux – “It seems to me that all of those linux guys are just kids playing with computers, those things should work and they don’t and when they do it’s because you spend a lot of time configuring stuff on my computer to make they work”, I couldn’t disagree. It’s sad, It’s the truth: We like to configure our linux boxes but the overall user wants just to use computers and it should work reliably. Today Cléo changed her distribution be cause all of the help that she could got on ubuntu only made her computer worse, and is using the same as I use, for I know that I’ll have the time when she needs to help her – I’v spend almost a day configuring it for her so she wouldn’t need to worry about repositories, packages and whattanot. Gave her a brief introduction on what she could touch that will not break the system and what she couldn’t, and she’s now a Linux user, not happy one yet because the HPLIP is still giving her headaches. Overall, not a very good experience on her, but we can do so much better in the future. In all honesty, the biggest problem was removing Windows from all computers at the same time rather than taking the time to get to know the new operating system before rolling it out to the rest. Then making it worse, doing what random people say on the Internet without taking the time to understand what they are telling her to do. Going further, this is really the job of IT staff who are at the ready to solve issues quickly during such a transition. To be honest, GNOME is a better choice for users rather than KDE. Even Ubuntu 14.04 with Unity is a better choice for your average user. KDE is only suitable for power users. GNOME is nice about taking care of all the harder stuff like printer setup automatically as soon as you plug in a new printer, and providing a very simple user interface using simple names and large buttons to make it easier for them to remember. HP drivers are fine — I’ve got someone who works in the printing business exclusively using Linux and printing on various different kinds of printers — even a 16 year old HP LaserJet 6MP — without problems. His work involves heavily around using Scribus (for desktop publishing) and GIMP/Krita (For image manipulation and converting the RGB color space to CMYK efficiently). He’s been doing that successfully for the last year without any problems at all. If the paper comes out black and white you simply have misconfigured printer driver settings in either LibreOffice or the printer manager. You need to make sure you are using the correct printer driver as well, as there is more than one driver for HP drivers. You can tell if you have the wrong driver if what you print looks like it has dots in the image rather than being a smooth shade. Rather than Thunderbird, GNOME’s Evolution is simpler and faster. PS: It’s I’ve, not I’v, and it’s whatnot, not whattanot. About gnome and unity, she had lots of problems with them because she was just too much “Windows centered”, and kde after a few tweaks made her use of Linux much more smooth. The hplip issue is as follows: on libre office the “color” settings doesn’t work and everything is black and white, if we export to PDF and use okular to print, same settings, it works. There are a few issues here. Some can be dealt with. Hardware drivers -> As a hardware seller you if your hardware has broken for the current version of Windows you won’t be in business very long. The same isn’t true of Linux. With Linux you are generally using hardware that was designed to work with Windows. There are several layers of people all making sure that the experience is smooth out of the box. On Linux somebody still has to do that work. In many cases that ends up being the end user. Until adoption rates get above a certain level I don’t see that changing. There are factors that compound the experience, the main one is that Linux is not a mono culture. This greatly increases the chances that you will be using a combination of hardware and software that hasn’t been tested by somebody who can do something about it. I am guilty of this. I am even guilty of this when I know damned well that there is a graphical way of doing it. There are a couple of reasons why. 1) forums are inherently text based. It takes me a few minutes to test out a command line and paste it into a forum. It takes me a couple of hours to take screenshots annotate them to explain clearly what the user should do. It is also a lot more likely that I will miss a step or the user will meet a point of confusion that I did not anticipate. 2) I am a KDE user. More often than not the user is having troubles with a desktop I don’t have installed and more often than not one a couple of years behind the current one. Over the last decade the command line has been more or less the same on Debian based systems, some desktop components change fairly drastically within 6 months. I think that easy to use screen capture software, with the features you need to make a tutorial and upload it in the space of a few minutes would go a long way. Agreed completely with your points – the problem is that a complete non-techical user usually don’t understand the commands that she should “just copy and hit enter” and sometimes there’s a YOUR_FOLDER_HERE on the pasted stuff that does a lot of bad things because the user don’t know what to put there. Regarding the “everybody tells her to do things differently” issue, I wonder how bad it is compared to other OSes ? I’ve lost touch with Windows over the past 10 years and never knew OSX well, but AFAICS there’s plenty of scope to do the same thing 10 different ways. Usually on windows the most prefered way is “do the GUI thingy following a lot of pictures” way, same goes for mac, instead of “look all of this nice different commands that I need to paste on a black screen and hope it won’t kill my system”. and on linux if we try to do that we need to keep in mind that the user could have unity, xfce, gnome or kde ( naming just a few ) so a lot of screen captures must be done in all of those different interfaces just in case the complete-non-technical-user doesn’t gets lost. HPlip works fine. Maybe you have a bad versión, a bad driver installation, maybe another thing. Perhaps you want use CUPS. In the other hand, users have a problem _with community versions_. Users tolerate any fail of Windows or Mac, but the same error in Linux is “cause is a system that young hackers use”. Users may have a different expectation if they try rhel or SLED. Anyway, if users don’t see the configuration proccess (just with the other systems 😉 until it’s finished, expectation will be different, too. Please continue your series! The story is compelling. One day, I will have to help friends or family switch from Windows to Linux. Reading about your experience is helpful. First of all, i’m C++ programmer and i’m normal human, normal user. KDE is best desktop can use till now, it is for every user. I use KDE since 2009, i start like idiot till now i’m normal user. My brother, it’s not technical man, use KDE since KUbuntu 12.10 without any problems with office, browser, KOrganizer, Android phone(MTP), Skype, Dolphin, printer. There is no sense in criticizing the user for her actions. The setup of a computer by this time should be no more complicated than putting in a new base station for one’s phone and scattering the additional handsets around the house. The reason this hasn’t happened is because of their is no single standard that must be adhered to if one wants functionality. For our phone systems the standard was set by the monopoly of Bell. For our move to digital television, Congress had to step in. For computers Microsoft provided the standard. There have to be standards that must be adhered to for basic functionality. No install of a Linux distribution should occur until there has been an analysis of the system on which it is to be installed to let the user know of any issues that will affect the installation. No user should have to deal with partitioning issues except as part of a custom install. There should be a program on every distribution that sets up a recommend partition of the drive with dual boot as a default if there is another operating system on the disk. And there should be no difference in the layout of a file system and system files from one distribution to another. All custom elements should reside in a specific directory for that distribution and not be scattered amongst other directories. Why is it that the RPM format is the same for different Linux distributions but as noted on Wikipedia “the detailed conventions and guidelines may vary across them”. Choice that paralyzes is not choice and too many choices paralyze. Many choices is indicative of technological immaturity. Computers on the hardware size have had standardization. Previously we had serial ports, parallel ports, DB-9 etc. and now we have USB. Mass usage requires standardization no matter what. Some would argue that the standard should be set by the marketplace. That is a case for monopoly. Some think it should be set by a committee of knowledgeable people (eg W3C or IEEE) which is fine but it is no good having such groups making their proposals voluntary. It only leads to a dragging of the feet. Look how long it has taken for MS to adher to web standards which only served to gum up the works for developers. There is no best decision. There is only a decision to be made in the current environment. It is well known that the best technology doesn’t necessarily win in the marketplace. If the choice is between the best and standard functionality across the board, I would choose standard functionality. Such standards can change but they have to be coordinated in time and be mandatory. Individualism and mass society are inherently at odds. Individualism is only the frosting on the cake of core functionality that is necessary in any mass society. Choice is not an absolute and should not be the guiding principle of anything because whoever is espousing such is not talking about Choice but a subset of choices that they believe will be of benefit. The question is who benefits. In many cases users don’t benefit. Users are mainly conned into accepting the subset of choices oftentimes it not being in their interest but in the interest of those putting forward their own particular subset.